40+ years experience with software development industry & 26+ years with Graphical User Interface (GUI) design & development within a Windows PC Operating System environment. Familiarity with 16-bit and 32-bit Application Programmer Interface (API’s) commands, with other Dynamic Link Libraries (DLL’s), with Third Party components, with ActiveX, COM\DCOM\COM+, and with using Integrated Development Environments (IDE’s). Experience with Fortran Development (and historically with PL/1). Also some historical experience with Assembly language programming (hexadecimal\octal\binary conversions), floating point, fixed point, and double precision considerations from the ground up (fully utilizing the so-called “Harvard machine” architecture and other newer architectures). Extensive recent 2004 experience writing and simulating systems in MatLab® and Simulink® (as applied to GPS\INS navigation and radar target tracking) but also has hands-on familiarity with MatLab® and Simulink® use since 1992. Work for MITRE in 1997 and for XonTech and Raytheon in 1999\2000, respectively, also involved use of MatLab® and Simulink® as did our work for Arete in 2004, Goodrich ISR in 10/2012-5/2013, OKSI in 11/2013-3/2014, and Aurora Flight Sciences (now part of Boeing) in 2015. TeK Associates is also following recent serial gigabit per second rate developments in VXS (Switched Fabric for 6U VMEbus such as Infiniband, Serial RapidIO, PCI Express & PCI Express AS, Gigabit Ethernet, StarFabric and associated specifications as, respectively, VITA 41.1, 41.2,.41.3, 41.4, 41.5), XMC (Switched Fabric Mezzanine Module), and VITA 49 Digital IF Forum. TeK Associates has also become aware that the best of both worlds may now be achieved by ruggedized packaging of Commercial Off-The-Shelf (COTS) cards and processors in Line Replaceable Units (LRU’s) and in ARINC 3/4 ATRs to match prior Form, Fit, and Function (F3). TeK Associates is especially enthusiastic about the emerging PCI Express (PCIe)standard that is already shipping on 200 Million Laptops in 2006 and more in 2007 and PCI Express’s capability for handling multiple CPU’s and cables up to 7 meters long and with data rates of 10 GigaHertz/Second each way and to be low cost as well ($30-$40) with high end multiple CPU versions at ~$100 (and also 3U version already approved by the PXI Consortium)! To aid in making the transition as gentle as possible over the next few years, new computers will have both the older PCI ports as well as the new PCI Express (PCIe) ports. (As of early May 2006, the IEEE Draft 802.11n, constituting emerging Wireless standards, failed to pass but it did finally pass in September 2009.) Meanwhile a new standard is evolving for the Small Computer System Interface (SCSI) as a serial version aptly named Serial Attached SCSI (SAS). 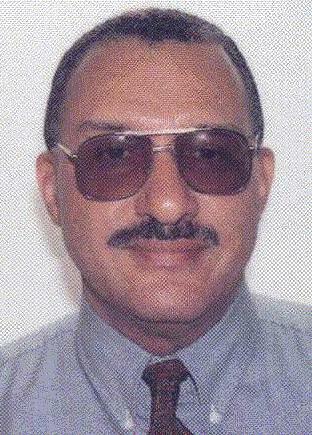 According to page 7 of the November 2006 issue of Military & Aerospace Electronicss, Vol. 17, No. 11, “VITA and VME Technology Mark 25-Year Milestone,” it is stated that “VME technology is in more than 25 million products”. In the past, nearly 60 VME technology specifications have been defined to meet the evolving needs of critical embedded systems. Most recently, VITA introduced VPX VITA 48 specifications to enable networked fabrics in 6U rugged systems, VITA 51 methods to determine system reliability, VITA 56 mezzanine module options, and VITA 58 packaging schemes to make systems more robust and interchangeable. We are already knowledgeable about various incremental historical versions of Visual Basic, their particular idiosyncrasies, weaknesses, or “features”; their impact, and their resolution as preferred or recommended work-around “bug” fixes. We have gone through several development cycles with these tools over the years and are aware of “what works” and “what doesn’t”. This hands-on experience is especially important regarding the efficacy of third party tools, where industry reviews in magazines that run advertisements for these same tools may be more flattering than is warranted. We remember our pain in gaining this experience and seek to spare you similar pain in your projects and endeavors. We recognize that GUI’s can be implemented in interpretive software languages and still be faster than a human’s response while numerical calculations are always to be implemented in truly compiled software languages to reap the benefit of speed and timeliness. We are cognizant of historical state-of-the-art software as well -. At General Electric Corporate Research & Development Center in the early 1970’s, Dr. Kerr was a protégée of his fellow coworkers: Joe Watson, Hal Moore, and Dr. Glen Roe (the degree to which this early exposure benefited him has only recently been realized by him, as that early experience continued to unexpectedly influence him over the four+ decades that ensued). Experienced in development for Microsoft Windows. We know how to effectively use API’s and how to partition a large project into smaller manageable pieces by “divide-and-conquer”. We document our code so that it is easier to maintain. We understand why and appreciate the need to do so. Expediting software development in VB, Fortran, MatLab®, and Simulink®. We also have experience with National Instruments’ LabView® ver. 8.1, and likewise with S-Plus® Ver. 4.5 MathSoft’s S-Plus® Ver. 4.5 and Latent Gold® statistical software, with Mathsoft’s MathCad® ver. 13, with Mathematica®, and with Microsoft’s Zing® (at http://research.microsoft.com/zing); all of which we possess except for LabView®. We have some experience with The MathWork’s real-time workshop and with cross-compilers (to generate embedded code for other target machines). We have an extensive repertoire of mathematically oriented software code to draw from that has already been verified and validated. We are adept at generating new test cases when needed (as illustrated in the representative publications offered below). We have an extensive library of textbooks (and sample code) in each of the above mentioned areas. We know how to construct numerical examples to confirm proper operation of candidate code and also know how to construct counterexamples to reveal problems if certain candidate proposed algorithms don’t work because the underlying theory that supposedly supports it is flawed. We have a thirty year track record in performing these exercises in a variety of application areas. Besides knowing technological history, we also diligently follow new developments as well such as evolving software standards: DO-178B and ARINC-653. Eternal vigilance is required in order to be up-to-date. Although it is not our main bailiwick, we had historically participated in many IV&V aspects relating to multi-level security of the World Wide Military Command and Control System (WWMCCS) software, more specifically our experience pertained to the WWMCCS Improvement System (WIS) viz. - relating to use of coaxial cable versus triaxial cable/grounding, potential vulnerability of fiber optics links, addressed WASSO (i.e., system administrator) issues and concerns, wrote MLMR white paper on use of encryption vs. check sums, scoped initial version of overall security plan. 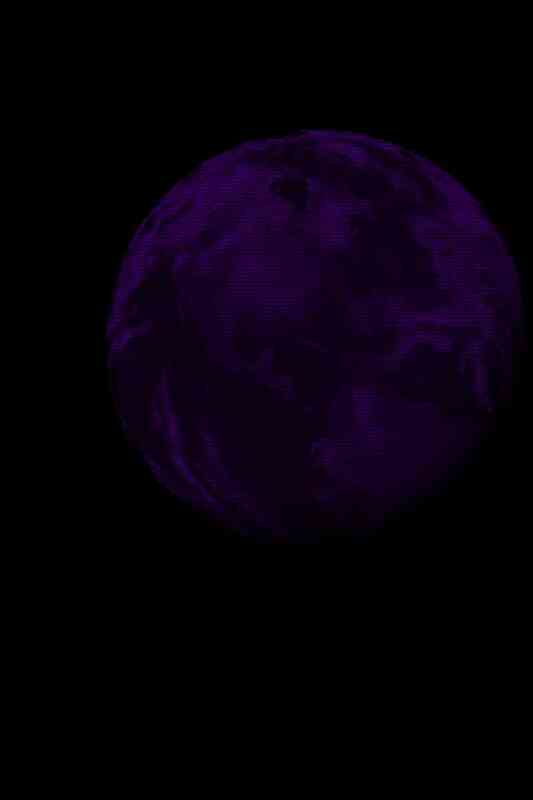 (WWMCCS was decommissioned in 1996 and replaced by Global Command and Control System.) Familiarity with Orange-, Green-, Yellow-, and Blue- books. (Obviously, this assignment had nothing to do with Kalman filters but, never-the-less, was extremely useful to us years later regarding how to properly handle passwords, do classified processing, do classified deletes, and the how’s and why’s of enabling encryption within TeK Associates’ current TK-MIP software product. This particular experience made us cognizant of security aspects in the early 1980’s way before we later developed our own PC-based TK-MIP software so that we already knew how to enable an alternative classified mode of signal processing (with password protected user access, with encryption of critical model parameters and results, and with secure deletion of files when needed after finishing the processing and displaying of results). We understand that “Loose Lips Sink Ships!”. TeK’s updated version of this slogan is: “Low MIP’s Sink Ships!” TK-MIP’s classified mode of processing is merely “Confidential”. ) Please click on TK-MIP verion 2.0 for PC button at top of our Home Page screen to proceed to a representative free demo download of our TK-MIP software. 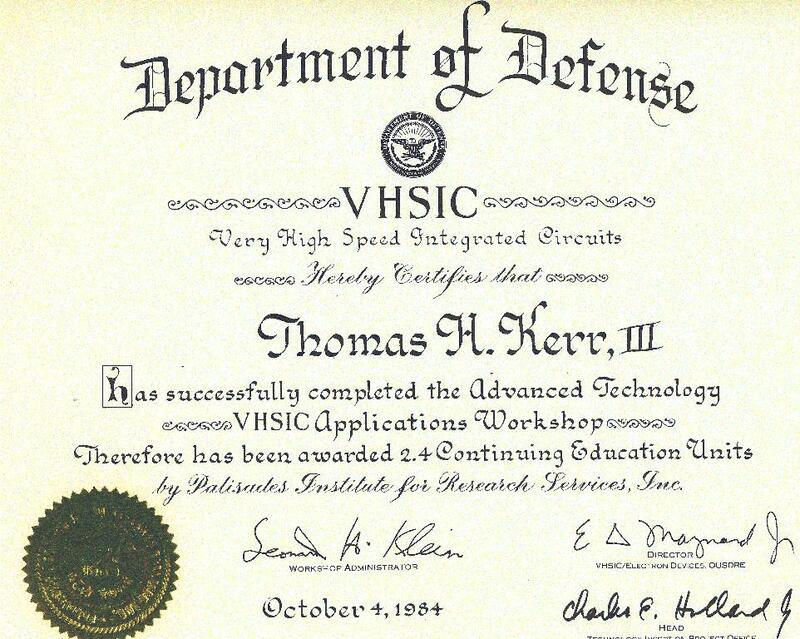 Click here to obtain a detailed 176Kilobyte resume for Thomas H. Kerr III emphasizing only his software experience. Kerr, T. H., “An Invalid Norm Appearing in Control and Estimation,” IEEE Trans. on Automatic Control, Vol. 23, No. 1, pp. 73-74, Feb. 1978 (correction in No. 6, p. 1117-118, Dec. 1978). Kerr, T. H., “Introduction to MSM-ll Independent Verification and Validation,” Intermetrics Memo, Cambridge, MA, 30 Oct. 1981, for NADC. Kerr, T. H., “Assessment of the Status of the Current Post-Coherrent Localization Algorithm,” Intermetrics Report No. IR-MA-319, Cambridge, MA, 31 May 1984, for NADC. Kerr, T. H., “WIS System Support Contract: TEMPEST Considerations for the LANCC/SM: Interim Report,” Intermetrics Report No. IR-MA-559, for RMS Technologies, Inc., 25 Nov. 1985. Kerr, T. H., “WIS System Support Contract: Potential Vulnerability of Fiber-Optic Links,” Intermetrics Report No. IR-MA-569, for RMS Technologies, Inc., 25 Nov. 1985. Kerr, T. H., “WIS System Support Contract: Tutorial Overview/Bibliography on Security Aspects of WIS,” Intermetrics Report No. IR-MA-572, for RMS Technologies, Inc., 25 Nov. 1985. Kerr, T. H., “WIS System Support Contract: MLMR White Paper,” Intermetrics Report No. IR-MA-573, for RMS Technologies, Inc., 25 Nov. 1985. Kerr, T. H., “WIS System Support Contract: An Assessment of Security Issues of Current Concern to WASSOs and Other Members of the SCWG,” Intermetrics Report No. IR-MA-599, for RMS Technologies, Inc., 22 Jan. 1986. Kerr, T. H., “The Proper Computation of the Matrix Pseudo-Inverse and its Impact in MVRO Filtering,” IEEE Trans. on Aerospace and Electronic Systems, Vol. 21, No. 5, pp. 711-724, Sep. 1985. Kerr, T. H., “Computational Techniques for the Matrix Pseudoinverse in Minimum Variance Reduced-Order Filtering and Control,” in Control and Dynamic Systems-Advances in Theory and Applications, Vol. XXVIII: Advances in Algorithms and computational Techniques for Dynamic Control Systems, Part 1 of 3, C. T. Leondes (Ed. ), Academic Press, N.Y., 1988. Therrien, C. W., and Kerr, T. H., “Results of 2-D Spectrum and Correlation Analysis,” Group Memo No. 95.3155, MIT Lincoln Laboratory, Lexington, MA, 8 Sep. 1987. Kerr, T. H., Kaufman, J., “Satellite Survivability: 3-D Geometric Update to the prior 2-D Analysis of Bearings-Only Target Triangulation-Further Gauging the Deleterious Impact of Satellite Navigation/Attitude Uncertainties on Required Operational Performance,” Group Memo No. 95.3560, MIT Lincoln Laboratory, Lexington, MA, 30 Mar. 1988. Kerr, T. H., “The Principal Minor Test for Semidefinite Matrices-Author’s Reply,” AIAA Journal of Guidance, Control, and Dynamics, Vol. 13, No. 3, p. 767, Sep.-Oct. 1989. Kerr, T. H., “An Analytic Example of a Schweppe Likelihood Ratio Detector,” IEEE Trans. on Aerospace and Electronic Systems, Vol. 25, No. 4, pp. 545-558, Jul. 1989. Kerr, T. H., “Fallacies in Computational Testing of Matrix Positive Definiteness/ Semidefiniteness,” IEEE Trans. on Aerospace and Electronic Systems, Vol. 26, No. 2, pp. 415-421, Mar. 1990. Kerr, T. H., “Rationale for Monte-Carlo Simulator Design to Support Multichannel Spectral Estimation and/or Kalman Filter Performance Testing and Software Validation/Verification Using Closed-Form Test Cases,” MIT Lincoln Laboratory Report No. PA-512, Lexington, MA, 22 Dec. 1989 (BSD). Kerr, T. H., “A Constructive Use of Idempotent Matrices to Validate Linear Systems Analysis Software,” IEEE Trans. on Aerospace and Electronic Systems, Vol. 26, No. 6, pp. 935-952, Nov. 1990 (minor correction in Nov. 1991 issue). Kerr, T. H., “Multichannel Shaping Filter Formulations for Vector Random Process Modeling Using Matrix Spectral Factorization,” MIT Lincoln Laboratory Report No. PA-500, Lexington, MA, 27 Mar. 1989 (BSD). Kerr, T. H., “Numerical Approximations and Other Structural Issues in Practical Implementations of Kalman Filtering,” last chapter in Approximate Kalman Filtering, edited by Guanrong Chen, 1993. Kerr, T. H., “Emulating Random Process Target Statistics (using MSF),” IEEE Trans. on Aerospace and Electronic Systems, Vol. 30, No. 2, pp. 556-577, Apr. 1994. Kerr, T. H., “Use of GPS/INS in the Design of Airborne Multisensor Data Collection Missions (for Tuning NN-based ATR algorithms),” the Institute of Navigation Proceedings of GPS-94, Salt Lake City, UT, pp. 1173-1188, 20-23 Sep. 1994. Kerr, T. H., “Verification of Linear System Software Sub-Modules using Analytic Closed-Form Results,” Proceedings of The Workshop on Estimation, Tracking, and Fusion: A Tribute to Yaakov Bar-Shalom (on the occasion of his 60th Birthday) following the Fourth ONR/GTRI Workshop on Target Tracking and Sensor Fusion, Naval Postgraduate School, Monterey, CA, pp. 406-426, 17 May 2001. Kerr, T. H., “Exact Methodology for Testing Linear System Software Using Idempotent Matrices and Other Closed-Form Analytic Results,” Proceedings of SPIE, Session 4473: Tracking Small Targets, pp. 142-168, San Diego, CA, 29 July-3 Aug. 2001 (contains more sections than ). Roe, G. M., Pseudorandom Sequences for the Determination of System Response Characteristics: Sampled Data Systems, General Electric Research and Development Center Class 1 Report No. 63-RL-3341E, Schenectady, NY, June 1963. Watson, J. M. (Editor), Technical Computations State-Of-The-Art by Computations Technology Workshops, General Electric Information Sciences Laboratory Research and Development Center Class 2 Report No. 68-G-021, Schenectady, NY, December 1968. Carter, G. K. (Editor), Computer Program Abstracts--Numerical Methods by Numerical Methods Workshop, General Electric Information Sciences Laboratory Research and Development Center Class 2 Report No. 69-G-021, Schenectady, NY, August 1969. Carter, G. K. (Editor), Computer Program Abstracts--Numerical Methods by Numerical Methods Workshop, General Electric Information Sciences Laboratory Research and Development Center Class 2 Report No. 72GEN010, Schenectady, NY, April 1972. 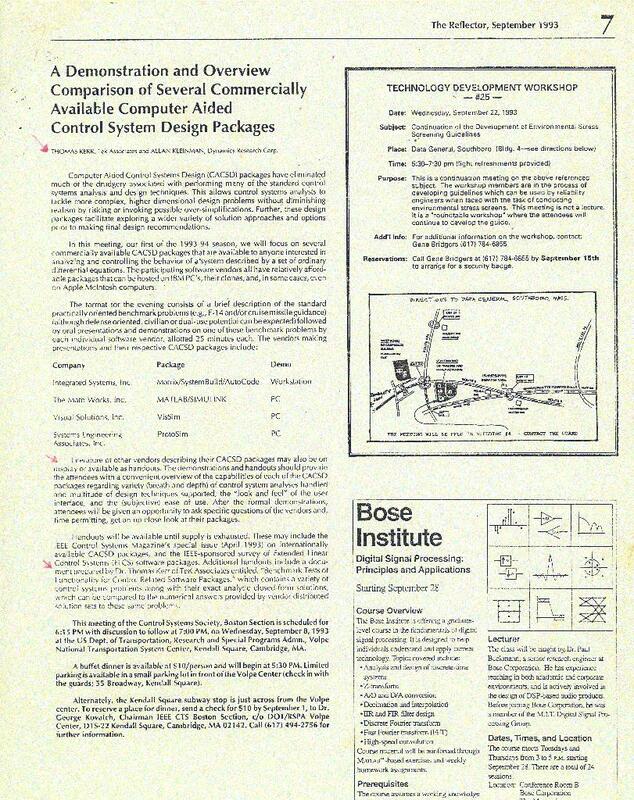 Michael F. Hordeski, Control System Interfaces: Design and Implementation using Personal Computers, Prentice-Hall, Englewood Cliffs, NJ, 1992. Zeller, A., Why Programs Fail: A Guide to Systematic Debugging, 2nd Edition, Evelsier, Inc., Burlington, MN, 2009. Jorgensen, P. C., Modeling Software Behavior: A Craftman’s Approach, American Publications, Taylor and Francis Group, LLC, 2009. Fernandez, M., Models of Computation: An Introduction to Compatibility Theory, Springer, NY, 2009. Nathan Thomas Kerr (notice the coincidence in names), "ALTERNATIVE APPROACHES TO PARALLEL GIS PROCESSING," Arizona State University Masters Thesis (with computer code), December 2009. Jorge A. Calvo, Scientific Programming: Numeric, Symbolic, and Graphical Computing with Maxima, Lady Stephenron Library, Newcastle on Tyre, UK, 2018.